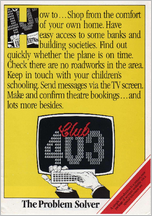 Prestel�::�Club 403�::�Celebrating the Viewdata Revolution. A service of Viewtel Services Ltd and the Birmingham Post.. Working in conjunction with local Tv dealers, they provided viewdata-enabled televisions to subscribers and offered a range of innovative home based services. Certainly this was a world leader! Club 403 is the only system in the world to offer a comprehensive interactive home shopping service. As a world leader in this field the Club ensures that it keeps its members abreast of the latest changes in visual technology and offers users up-to-date information, news and services via. the Prestel network. Launched exclusively in the West Midlands to forge new techniques in electronic information, the Club has successfully produced numerous services direct to the homes of more than one thousand Midlanders. It has introduced instant Armchair Grocery and Mail Order Shopping along with Booking to its subscribers and a whole host of information pages that encompass leisure, motoring, finance and travel Information, as well as education and childrens' sections. 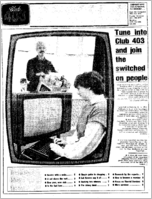 If you tune into Club 403 you can guarantee becoming one of the country's "Switched On" people. In short you will have the news, views and shopping facilities of UK and the West Midlands at your fingertips . 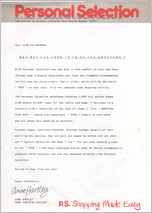 . .
A selection of correspondence and newsletters.